Andy is behind the bar Monday through Friday days. 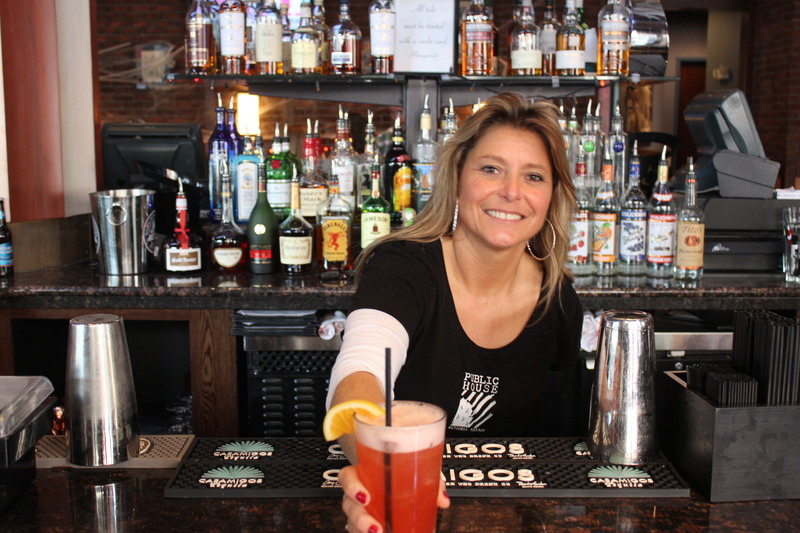 How did you get started in the bartending business? I got started out in the business through my Dad – best known as “Russian Mike”. He owned a few joints back in the day including the Quarter Deck in Arlington and Jonathan’s Place in Crystal City (he was partners with Bill Bayne Sr.) and Michael Anthony’s in Maryland. This was the 70s early 80s .When it was time to get a job – I was 17 getting ready to turn 18 – I started waitressing at Champions in Falls Church which later became Broadstreet Bar and Grill. I’ll never forget it! My first night started out as a disaster! I was thrown to the wolves! Lol! The first table I waited on was these guys in this band called the Road Ducks. Some of you might remember them, they were very popular through NOVA back then. Anyway, the lead singer, Mike McCormick (who is gorgeous by the way), and his girlfriend (who was wearing a fur jacket –white at that) were at the table and I spilled my whole tray of drinks on them! Needless to say, my money went to dry cleaning that night. My dad’s best friend, Bill Bayne Sr., and his son Billy Bayne Jr. along with Arty Dourty and Jimmy Madden opened the Crystal City Sports Pub in August of 1994. That was really the bar I can say I grew up working in. Don’t ever come to my bar and say “can you hook me up?” and then proceed with telling me you are “in the industry” and my tip will be better if I do. I will then take you aside and politely school you in bar etiquette! I never went anywhere in my days and expected a hook up from anyone…. we still tip the hell out of them no matter what. What is the cleverest line anyone has ever used to get you to spring for a free drink? Ahh…”Someone told me there was a bug in my drink, can you make me another for free?” I said, “No… that will cost you extra since that’s additional protein!” I have said that as a joke and the reaction from people is hilarious to me. Here’s another one…”Can I get another drink? This one didn’t taste right.” I said, “Sure, where is it? I’ll chuck it for you.” “Oh, I drank it already!” Ok buddy, wasn’t born yesterday LOL! What is the best/worst pick up line you have heard at the bar? I have heard a quite few but there isn’t any one that stands out. OMG… and I know I’ve heard some good ones too! Oh back in the day I’ve had a few tell me “has anyone told you that you look like Christy Brinkley or Cheryl Tiegs?” I said, “Are you high?” LOL! Give this man another drink. Tell us about an interesting encounter you have had with a customer? It’s a small world after all, especially in this business for some reason. Haha! Do you mean jumping over the bar encounter? We won’t go there! Or someone you met out of the blue? I was working downtown during President Obama’s first Inauguration. Initially, I said you couldn’t pay me enough to be in the city on that day! Well a friend called in dire need of bartenders so I agreed. Actually, it was not what I thought it would be. It was an awesome experience – the vibe in DC was like nothing I had ever experienced before. You talk about all walks of life, all together, it was really awesome to be working in DC that weekend. Anyway, I struck up a conversation with a guy from Germany and he looked familiar to me for some reason. Long story short, he used to jam with my cousin in Germany along with the Famous Scorpions back in the day. I have had quite a lot of interesting encounters – its crazy. I guess I will save them for the book – haha! If you could sit down with anyone – past or present – and have a drink, who would that be? Past, it would be my late husband, Stephen Gillies, and my father, Russian Mike. They were always a riot to party with – always fun and never a dull moment for sure! Present, Ozzy Ozbourne, Nikki, Six, Robert Plant, Miles Kennedy, Lita Ford, and Grace Slick….I could go on and on.